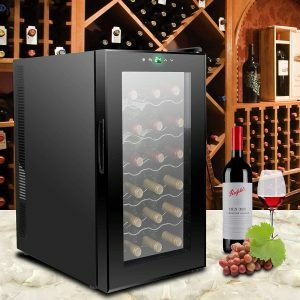 ZENY 18 Bottle Thermoelectric Wine Cooler is a countertop style standalone type unit for your white and red bottles with an elegant and innovative design, a digital LED-backlit display and a tempered glass door. The rating is 5 out of 5 stars by three customers at the time of this product review. You can use it on the floor, table or countertop in your home kitchen, bar area, living room, office or dorm rooms. The temperature can be adjusted between 50 and 64 degrees Fahrenheit through the up and down buttons on the touch button control panel, which is equal to roughly 10 and 18 degrees Celsius. This is 53 – 64° Fahrenheit (12 – 18°C) for the 12-bottle version. There is a lock function so what you set the temperature does not change by accident. 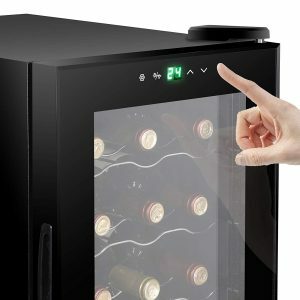 It will keep your white and red bottles in a stable environment at the optimal temperature and humidity and without vibrations for a short or long period of time. Your wines will preserve their original quality and rich flavors, taste and texture in the long-run. It has a 50-liter storing capacity for 18 regular sized and shaped Bordeaux type bottles. The precision thermoelectric cooling technology with the integrated circulation fan and ventilation grill lets it run quietly and efficiently. The double pane glass has the anti-ultraviolet layer to keep out the harmful UV rays and sunlight that may potentially damage the quality of your wines. The reinforced glass door has the air-tight seal to keep the cool air in. There is no compressor that does noisy cycles on this energy-efficient thermoelectric cooler. It runs very quietly and without vibrations and the natural sediments in your bottles will not be disturbed and they will age gracefully. You can put bottles that are 12.6” long and with a 3.4” diameter on the five polished chrome shelves that slide out very easily. This 18-bottle capacity cooler in engineered thermoplastic ABS plastic with a compact space-saving design measures 25.4 x 13.5 x 20 inches. It will take up only a small amount of space in your kitchen or bar area but will enhance the decor in any room. And the 12” cooler measures only 9.9 x 19.7 x 25 inches. There is the soft blue LED lighting inside for illuminating your wine bottles, that you can turn on and off through the control panel. You can conveniently switch between Celsius and Fahrenheit, whichever you prefer. Customers that bough this cooler seem very happy with its appearance and functionality. They say it looks better in the flesh than it does in photos.